Tribeca NW Guide: Find out why Bellevue Washington is great place to live! Real Estate in Bellevue, Washington. Bellevue, Washington is a growing metropolis in King County. 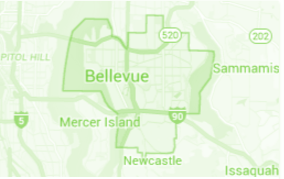 Being the 5th largest city in Washinton State, Bellevue has over 150,000 jobs, a growing popultaion of 140,000 and a downtown that is full of modern high rise buildings. In downtown you can find large offices of dozens of tech firms like T-Mobile, Expedia, Microsoft as well as industry leading giants like Paccar and Boeing! These companies along with thousands of others help keep the area flooded with great jobs! Bellevue is a vibrant city with stunning parks, top ranked schools, as well as a buzzing economy. The real estate market is one of a most expensive in the state. The median sales price for Bellevue is $900,000. The average price per sqft is $456 and the median rent is averaging around $3200 a month. The Bellevue School District is a public school district in Washington state. The district serves the Bellevue, Clyde Hill, Medina, Hunts Point, Yarrow Point, Beaux Arts communities. It also serves small portions of Newcastle, Kirkland, Issaquah and Redmond. The district is home to 27 schools, including 15 elementary, 5 middle, and 4 high schools. The district also has a Spanish immersion elementary school within it’s boundaries. Whatever time of year you spend in Bellevue, you are sure to love all of the exciting events and activities that are available to you. You’ll find annual events that have become part of the fabric of the community and new events that reflect Bellevue’s changing population and growing diversity. There are family events, fashion and arts events, stage productions and music festivals and events that get you out to appreciate Bellevue’s natural beauty and public parks. No matter when you’re planning an activity in Bellevue, it is easy to stay informed on everything going on in and around town. From quick takeout nibbles to sit-down luxury feasts, you can dine remarkably well on almost any Bellevue block. There are hundreds of restaurants in downtown Bellevue and many more across the city ranging from casual sandwich spots to 4-star chef owned restaurants and well known national chains. When the sun shines, Bellevue diners seek out the myriad outdoor dining options that pop up on patios and along sidewalks throughout the city. For a quick lunch, try one of the many food trucks scattered throughout downtown Bellevue during the week. If you’d like some music with your meal you’ll find a range of options from jazz, to pop, to bluegrass. With more than 250 stores, 45-plus dining and entertainment venues and a constant buzz of activity, it’s easy to see why The Bellevue Collection is a don’t miss destination. At The Bellevue Collection, you’ll find the best of style, scene and in between to dress your body and home. Browse through renowned stores like Nordstrom, Crate and Barrel, Macy’s and Tiffany & Co., or explore our dozens of unique shops that you won’t find anywhere else. Looking for a thrill? Bellevue has a number of opportunities to fit a little action and adventure into your life! There are also plenty of exciting outdoor experiences to try around the region. Few places in the world offer as wide a range of outdoor activities as Bellevue and the Pacific Northwest. Maybe that is why companies like REI, Kavu, Eddie Bauer and Outdoor Research were born here, and why locals think nothing of kayaking one day and backcountry skiing the next. Of course most of us also don’t let a little rain stop us from going outside. Playing hard the way locals do is a great way to get to know Bellevue. Bellevue’s burgeoning art scene bursts with soaring sculptures, steal-your-breath-away performances, a world-class art museum, and a number of audible delights for countless ways to feed your creative side. Bellevue’s downtown showcases nearly 130 works of public art available for anyone to enjoy. Many are readily seen by simply walking down the street or through the Downtown Park. If your interests include theatre and dance then check out the Meydenbaur Center. This intimate 410-seat theatre plays host throughout the year to an array of productions by local, regional and national performing arts groups as well as a number of new-to-the-area performing arts groups that reflect Bellevue’s ethnic diversity. Of course, you can embark on your own journey through Bellevue’s past with the Early Bellevue Walking Tour. This self-guided tour will take you to 24 historical sites from NE 8th Street to Meydenbauer Beach Park and Main Street. The listing data relating to real estate for sale on this web site comes in part from the Northwest Multiple Listing Service. Real estate listings held by brokerage firms other than Tribeca NW Real Estate are marked by the "three tree" symbol; detailed information about such listings includes the names of the listing brokers. Data last updated 2019-04-22T20:16:04.017.